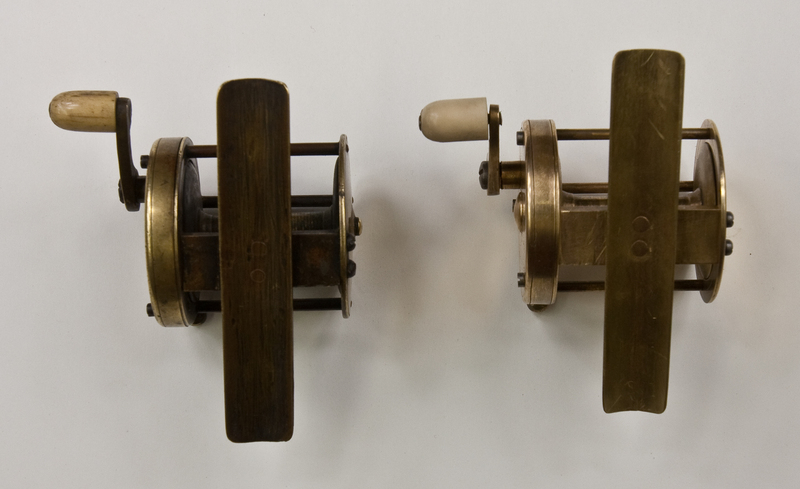 This installment shows the completed reel and its fitting on the rod! The mechanicals of the reel are complete, rivets peened, and the reel tuned. The only thing left to do is “age” it. My thoughts are to age the reel for the “10 year” look. Basically, a reel that has been in service and well used and cared for. I like to do this by speeding up the natural process. 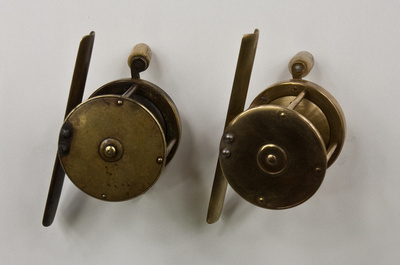 Brass patina is performed by fuming the reel in vinegar vapor for 8 hours. This gives the brass a golden color. I then polish the reel with sawdust and lemon juice – exactly like its owner might have done. This makes sure that the darkening stays in the nooks and crannies. The reel in the photos has been treated once and then polished. It is ready for the 2nd and 3rd treatments. Between the 2nd and 3rd vapor treatment, I will use burnt umber oil pain mixed with finely ground pumice to simulate grime and finger and fish oil build up. This mixture will be applied to the logical places (you can see where on the actual reel) and then gently blotted off. Once dry, the reel will be fumed one last time and then protected with a microcrystalline wax to lock everything in place. Now then are the two reels side by side for comparison. 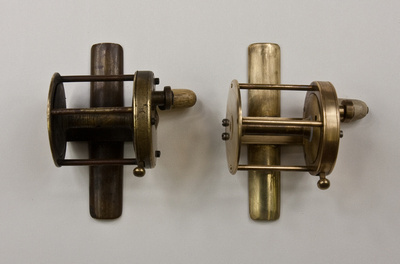 I like to call this “twin reels of different makers”! (you can click the photos to see the full resolution image). Back Side View – note the peened pillars! And now, the moment of truth – fitting the reel to the magnificent rod John crafted! I had to enlarge the foot mortise on the rod. I carefully mixed a concoction of finishes from John’s description and lo, it was a perfect match. Makes me want to go fishing! I’ll post more photos of the reel tomorrow when it is out of the final fuming! This entry was posted on March 2, 2010 at 12:53 am and is filed under reel, rod. You can subscribe via RSS 2.0 feed to this post's comments. You can comment below, or link to this permanent URL from your own site. that makes the rod look alot better, Michael! Sweet! Thanks John, don’t look at the reel seat mortise too closely 🙂 just kidding! Oh my Gosh — that is the coolest thing EVER! AWESOME JOB! Great job, Michael and John. That is one beautifully matched rod and reel. Very, very nice! Wow … I can’t say much else … in awe. That is really impressive guys!